Life on the farm was pretty intense all winter, and particularly so after my trip in July. As I finally sit down to write this, shearing has come and gone and four tiny cygnets are swimming with their parents on a much-depleted Swan Lake. 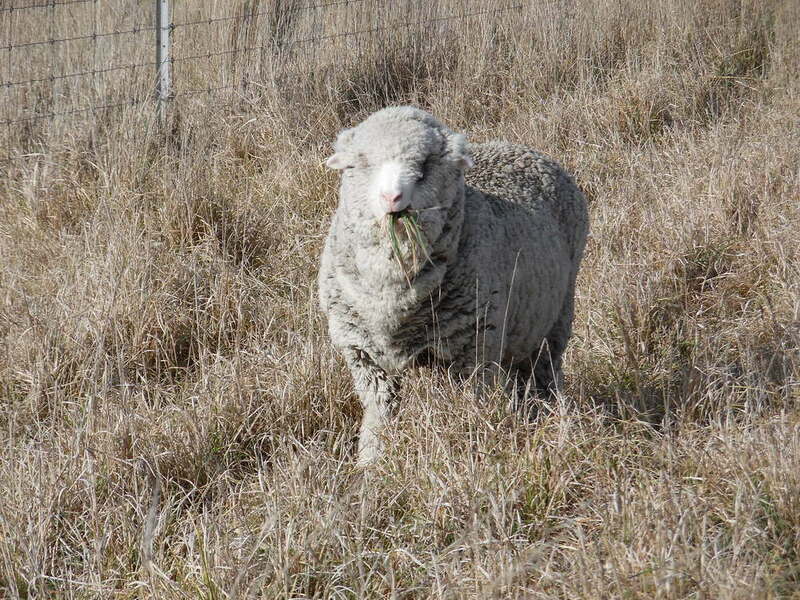 I’ll give you the shearing and end-of-winter shepherding report in the next Yarn, hopefully fairly soon. Meanwhile, here is the belated trip report. July took me out of my comfort zone a whole bunch of times. First, Lyn Heenan came to learn the ropes so she could farm- and yarn-sit. Incorporating another person into my routine was pretty challenging (and stepping into someone else’s routine was tough at times for Lyn) but happily we were able to talk it through and make it work. Lyn and best buddy Vicky. Lyn has tremendous affinity for animals, and it showed in how quickly the sheep (and dogs and cats) accepted her. As I hadn’t been away from the farm, even overnight, for more than 2 years, the prospect of a road trip was both scary and exhilarating. My two weeks away encompassed such diverse parts of my life it felt like much longer. I’d mostly lost the art of travelling I developed while working for CSIRO. Then, I was on the road for a couple of weeks each month so the logistics became second nature. Not so this trip. I’m happy to say I didn’t miss any planes, but navigating airports was a bit hair-raising. I’m trialling a new format for the Yarns, and I’ll be interested in your reactions. In addition to the written text, I’ll be providing short “video” clips you can link to. They aren’t really videos, rather a series of still photographs played like a video, with a voice-over from me. The luncheon tables set up for Women of Wool. I was feeling pretty nervous at this point, so distracted myself by taking photos. The gang on Sunday: left to right, me, Sandy Holdaway (pattern designer), Mary Donohue (wearing her 3-in-1 Henley made from 4 ply WGW), and Sally Oakley (pattern designer). I’m wearing the scarf that Mary Donohue knitted for me from a gradient by Agnes Bolton. After Bendigo, I headed to New Zealand for two completely different visits: Design Spun in Napier on the east coast of the North Island, where the yarn is processed, and Hinewai, an amazing reserve where native forest is being allowed to out-compete rampant gorse on reclaimed pasture. Hinewai is located on the Banks Peninsula south of Christchurch (South Island). 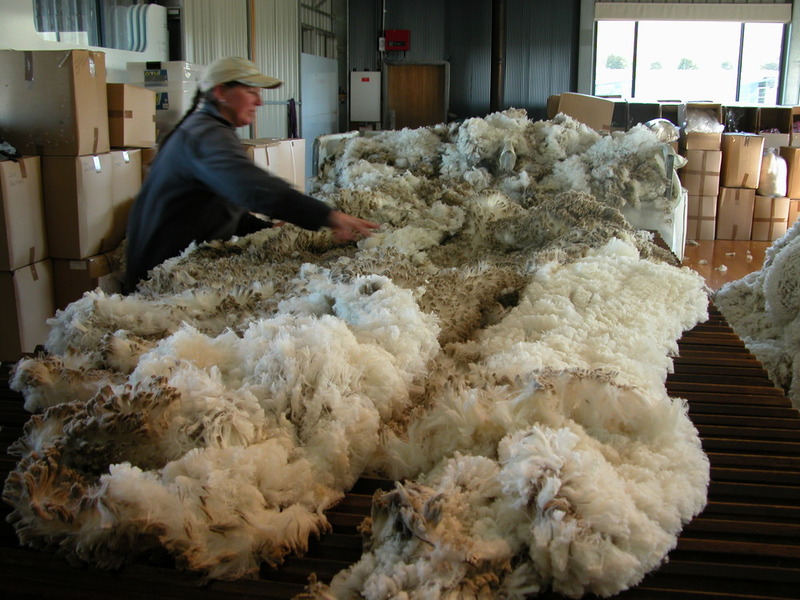 WGW being “gilled”–the process of aligning the fibres for a worsted spin. The sliver is pulled through the gilling machine many, many times to achieve the smooth, buttery feel of WGW yarn. Those of you who’ve been reading the Yarns for a while know what a wonderful company Design Spun has been for White Gum Wool—willing to work with me through a number of potentially fatal (for the yarn) issues, and providing an amazing quality and range of products. Getting to spend time there was just plain fun. I hung out in the factory for 4 days, talking to the many people who make the yarn possible, and absorbing as much as I could about the processing of wool fibre into yarn. The Design Spun video link will give you a lot more detail, if you’re interested. WGW on the spinning frame. Roving of about 1 cm diameter is drawn through the spinning gate to make the single strand that is later twisted (plied), combining 2 singles to get 4-ply, or 4 singles for 8 ply. After 4 full-on days at Design Spun, going to Hinewai was like a meditation retreat. One of my readers, Yvette Lewis, first told me about Hinewai last year, after reading the Yarn about quitting the use of herbicides on my property (Cosmic Intercepts). About 30 years ago, a stubborn, inspired botanist by the name of Hugh Wilson joined forces with philanthropist Maurice White, to purchase 1000 ha of exceedingly steep, clapped out, gorse-infested farmland on the volcanic slopes of Banks Peninsula. Among the over-grown cover of gorse, there was a small remnant population of native trees, shrubs and grass. Looking across Hinewai valley. The yellow bits are gorse in bloom, while the dark green is all regenerated native bush. The view from Hugh’s living room, down the valley to the sea. Hugh’s mission was to allow the natural regeneration of the native species to gradually shade out the gorse, which cannot grow, or even germinate, in shade. First, he and his team of volunteers had to remove all the non-native browsers (read all browsers, as there are no native browsers left in NZ since the demise of the big flightless birds): sheep, goats, cattle, deer, possums, rabbits, etc. to stop them destroying the native tree seedlings. Hugh, wearing his standard uniform of shorts–despite the winter weather, and more worryingly, the gorse prickles. And then they needed to minimise disturbance (fire, particularly) in order to keep from encouraging regrowth of gorse if the shade canopy opened up. Ironically, pretty much everything we are told to do to control gorse: spray, bulldoze, burn, graze heavily, etc. simply makes the world a safer place for gorse to flourish. 30 years on, the initial 1000 ha on Hinewai, with 75 % gorse and 25% native trees, is now 75% native bush—a delightful, healthy ecosystem with extensive habitat for native animals, great hiking trails, and water safe to drink from the several streams that run through it. For more details and photos, have a look at the Hinewai video. Some of Hugh’s books are available through Manuka Press in New Zealand. I haven’t yet found a source for "Hinewai, The Journal of a New Zealand Naturalist" (I bought the last copy in the museum at Akaroa). If I can track down a source, I’ll let you know. Hugh also puts out a newsletter every 6 months, to which you can subscribe, though you'll have to do so by post. Hugh doesn't have a computer, or a car for that matter (he refers to them as c*rs, and Christchurch as the "c*r-infested swamp"). Hugh goes everywhere by mountain bike, including his occasional forays to the aforementioned swamp (10 hours or so by bike from Hinewai). His address is 632 Long Bay Rd RD3, Akaroa Aotearoa 7583, New Zealand. There's a NZ $5 cost to cover postage. he view of Akaroa harbour from atop Stony Bay Peak. 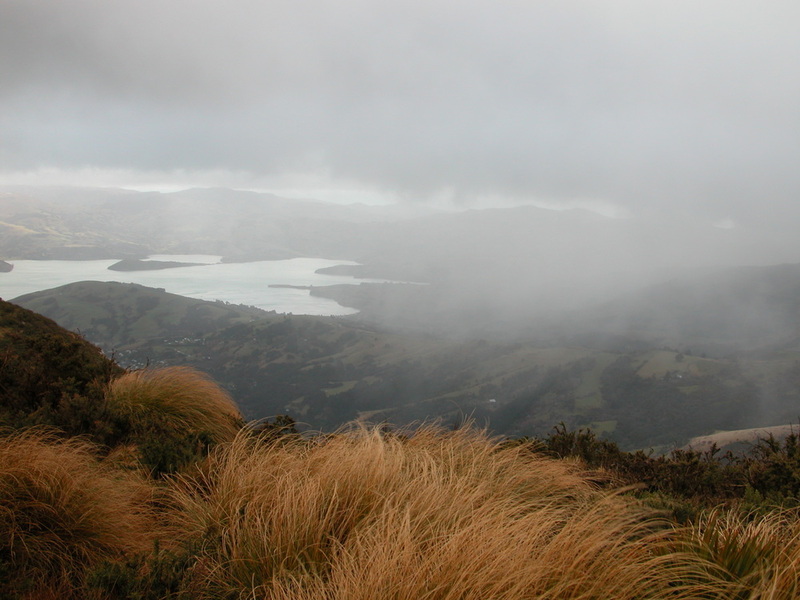 This was my last day at Hinewai, and the mild weather turned abruptly nasty–gale-force winds, snow, hail and rain. I felt right at home, and my new rain gear held up beautifully. I was thankful, though, to make it back to my c*r, and the relative shelter it provided while I ate my picnic lunch. I’m starting to work on how to adapt Hugh’s ideas to control gorse over time on my property. The dense shade required to kill off gorse is only provided by trees like my she-oaks (casuarinas) and blackwood (acacia). The mottled shade from gum trees and silver wattles just isn’t dense enough to do the job. Happily, I have several thriving groves of she-oaks and blackwoods, with thousands of saplings coming up through the gorse. So watch this space (for 30 years or so). A mature she-oak, with gorse nearby, but none in its shade. You can just make out a few she-oak saplings in the background. There are literally thousands of them now, as I’ve severely limited grazing in this area for a decade. Back home, it took me the best part of August to catch up, with a lot of late-winter shepherding as well as the yarn business. Just about the point I was feeling back on top of things (more or less), it was time to shear. Shearing went well, and the weather has been incredibly kind, especially considering what a hard winter we had, so the sheep are recovering nicely from the trauma of losing their 3-inch-thick winter coats in a single fell swoop. One of those 3-inch thick winter coats hitting the wool table. Karen fish is starting the process of “skirting”–removing the edge bits that don’t process well into yarn. The echidnas are on the move, and the cygnets have hatched, despite very low water levels in Swan Lake. Happily, the water table is holding, so all my springs are ok. (Swan Lake relies on runoff, of which there has been none in months.) We’re short on rainfall, but there is feed “ahead” of the flock at the moment, so I’m still hoping not to have to sell any sheep this year. I’ll know more once we see what sort of rain we get in October. Papa swan seeing off an inquisitive wood duck, while mama keeps the family moving. Oh, and the new multi-coloured yarn Ashmore, designed by Rebecca Robinson and commercially dyed by Design Spun, is here. The new multi Ashmore. On the left is the prototype designed and hand-dyed by Rebecca Robinson. On the right is the commercially dyed version. 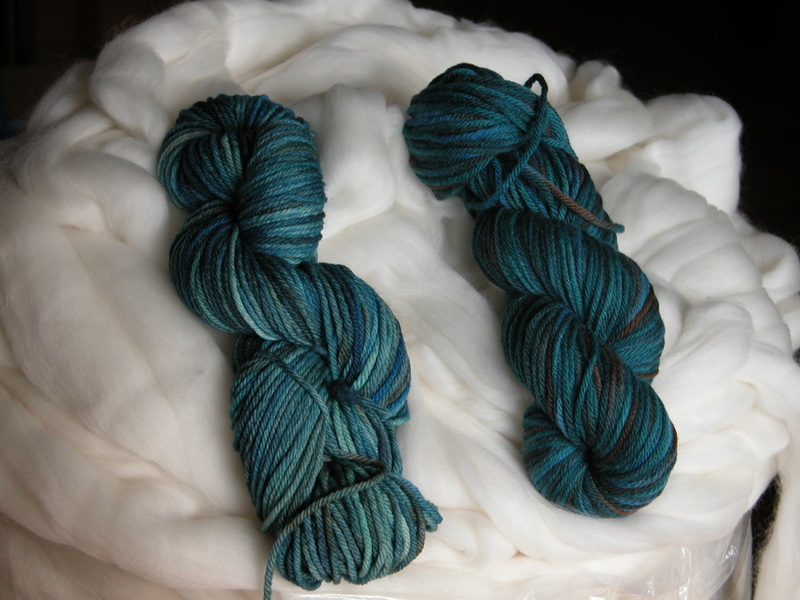 …and this is Design Spun’s machine for multi-dyeing. Each nozzle can squirt one of 4 different colours, a much more constrained system than hand-dyed. Peter Chatterton, one of the DS partners, started in the textile business as a lad in the dye house of major plant in the UK, and his incredible eye for colour and knowledge of what will (or won’t ) work, makes it possible for him to recreate Rebecca’s designs. Full points on Ashmore, Chatty!